If you have recently invested in physical gold, you are most likely looking for allocated gold storage options. When looking to store their gold, many investors choose to store some of their gold overseas and some in their home country. There are a few ways to do so. You can research offshore gold storage (such as in New Zealand, Switzerland, or Singapore), you can rent a bank storage locker, or use a private gold storage facility. As a Gold Investment customer, you would have the advantage of using our storage options as well. Physical gold and silver bars and coins are kept at the London Silver Vaults at a cost of £4 per one oz per year (minimum charge of £40). Some investors choose to keep their physical gold bars or coins in offshore accounts, which allows them to benefit from currency laws in other countries. Doing so has a few different benefits attached to it, such as protection from social unrest in their home country, gold confiscation, or litigation. For example, in the 1930s, the United States government made owning gold a crime punishable by up to 10 years in prison and a $10,000 fine. Storing your gold in an international account protects your investment from any such social unrest or potential currency collapse in your home country. When storing your gold offshore, it is then subject to the laws of that country, instead of the laws of your home country. Some of the best countries to currently store your gold in are Austria, New Zealand, Grand Cayman, Singapore, and Switzerland. If you would like to store your investments a little closer to home, a bank locker facility may be a good option for you. 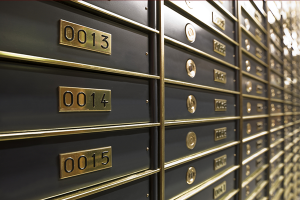 Renting a bank locker can be a good idea if you have your gold in coins such as Krugerrands or Gold Sovereigns, as they are smaller and take up less space. You can speak with your bank about renting a bank locker from them to store your investments or any other precious items you may own. One thing to keep in mind when renting a safety deposit box is that insurance on the items in the box is not usually included with the rental fee. You very well may need to find outside insurance to protect the items within your bank locker, just in case anything happens to it. This may increase the cost of keeping your investments in a bank locker, however, it will ensure more peace of mind. Whichever option you may choose to store your new gold, whether it is in an offshore account, a bank locker, or a private gold storage facility, finding the proper service for you is an important aspect of any gold investment.